The English is mangled but the headline the robots read is what the MEN is really interested in. 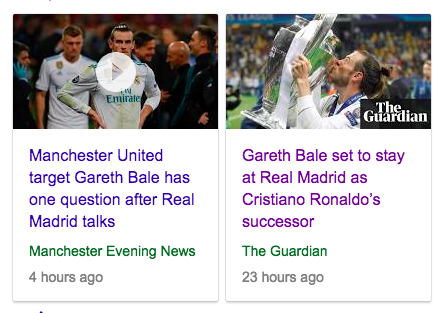 The URL for the paper’s clickbait nonsense is: “https://www.manchestereveningnews.co.uk/sport/football/transfer-news/cristiano-ronaldo-manchester-united-juventus-14911995.” No word of what Jose Mourinho’s “answer”, just the words “Transfer”, “Cristiano Ronaldo” and “Manchester United” in the same link. Whamo! The teaser adds: “Man Utd manager Jose Mourinho is set to meet the press for the first time this summer, with Cristiano Ronaldo high on the agenda.” A player who does not play for Manchester United is at the top of topics up for discussion?James Robson says “his first press conference since a rather irritated affair following the FA Cup final defeat to Chelsea promises to be a fascinating one”. And Ronaldo? Well, Robson tells us that “it’s understood United never seriously threw their hat into the ring when it became clear the five-time Ballon d’Or winner was ready to leave Real Madrid”. United didn’t want Ronaldo. Ronaldo didn’t want United. But Robson says “United have watched on [?] as Neymar and Ronaldo have proved eminently gettable.” The tin lid on this dire story is carried by “the belief” that United has “prioritised” the signing on Gareth Bale. What chance have United of signing Bale? Gareth Bale is set to be handed the challenge of replacing Cristiano Ronaldo as Real Madrid’s driving force when he meets his new coach, Julen Lopetegui, for talks in the next two weeks. Once again the Manchester United executive chairman’s pursuit of Gareth Bale comes down to a simple question of stick or twist. That is the dilemma on Bale’s mind after he held his first face-to-face with new Real Madrid coach Julen Lopetegui this week. The “one question” for Bale is should be stay or should he go? And United “are ready to move as soon as they get the go-ahead from Bale’s representatives.” Which they won’t. More shameless ball in the MEN every day.